You say that Leviathan is coming. But you don’t know what Leviathan is. Is that what’s troubling you, boy? Well, it trouble’s me that I don’t know what it is (yet), but Amanda Waller does. I appreciate Amanda as a character, because she can the the side wherever the prevailing wind blows. She can be on the side of the angels, or a major thorn in their collective foot. But that’s kind of why I don’t like her, is she is so handy for situations that require a fluid degree of deception and betrayal. She can be all over the map, as the narrative demands. 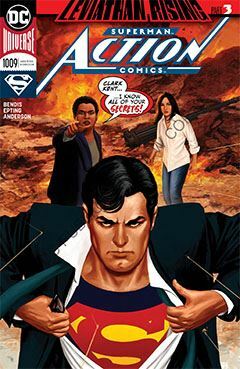 In the latest issue of Action Comics, she has drawn the ire of Lois and Superman, by showing up at their Metropolis apartment, blurting out Clark’s secret, and demanding protection. This leads to a journey to the new Fortress of Solitude – emphasis on the NEW because Bendis wants to make it clear that it’s NOT the original arctic version. To deal with both Waller and Leviathan, Superman seeks help, but his best assistance may come from an unlikely investigator (not Batman). Though Superman does share an opinion regarding the overlooked Alfred Pennyworth that is long overdue. I’m digging Epting’s artwork. It kind of has a retro feel to it, one I associate with the work of Jack Abel in the late ‘60s and ‘70s. It reinforces that the classic Superman is back, free from the residue of the New 52. The less said of that, the better.